The ProForm Hybrid Trainer Elliptical, introduced to the market in early 2013, comes with all of latest and most innovative features that can be expected when purchasing an elliptical trainer. With a price of only $377.00 on Amazon.com, this dark grey trainer includes a bevy of features that can be utilized in any type of workout. The most prominent of these is that of the LCD display, 15″ stride length and the 14 workout apps that come pre-loaded onto the machine. As a hybrid trainer, it has the unique ability to act as both an elliptical trainer and a recumbent bike. Here’s an in-depth review of the features, as well as the good and bad aspects of this hybrid elliptical trainer. 15″ stride allows for a more fulfilling workout. 14 workout apps that can be utilized and implemented into any type of workout routine. Hybrid technology that allows the user to both sit and employ the machine as an exercise bike and stand to use it as an elliptical trainer. Can digitally set 14 different resistance levels, each one progressively more difficult than the last. Grips on each side of the trainer that help to improve upper-body muscle tone. LCD display that includes a plethora of available settings to monitor effects of workout. Sturdy pedals that can be adjusted to the users preferences. This machine comes equipped with a handy heart rate monitor. The monitor is situated on the elliptical handlebars and allows the user to track their heart rate as they go through their workout routine. It tends to work well and registers the information very quickly. While working out, users will notice the well designed LCD display, located at the top of the machine, which allows users to easily track a wide range of settings that can determine how much a person has progressed during their workout. These settings range all the way from calories burned and revolutions per minute to the ability to set and follow actual weight loss goals. As with most ProForm products, the trainer and the parts that come with it are generally well built, sturdy enough to support a weight of up to 350 pounds and well designed enough to satisfy most users. Though hardly the most noteworthy features, the plush seats and water bottle holder aid well in creating just the right atmosphere for working out. The 14 various workout apps are easy to use and help to differentiate the usual monotony associated with exercising and working out. As they were designed by an actual personal trainer, it’s clear that they work quite well in helping a user to achieve their weight loss and muscle building goals. Potential customers will also be happy to know that the machine is exceedingly quiet, particularly during elliptical mode, though the recumbent mode does stay generally quiet, even with 2 people using the machine at the same time. The trainer also makes it extremely easy to adjust between both modes. All that needs to be done to position the trainer into recumbent mode is to simply flip the pedals up in order to make them level with the seat. Located on the LCD display is a useful target pacer. This setting allows users to completely customize their workout by simply inputting a few tidbits of info into the machine. Once this is complete, a light will tell users when they need to speed up and when it’s advisable to slow down in order to adequately reach the goals they have set. Along with the 14 resistance levels that allow for a wide range of different workout intensities, this trainer works quite well to offer the user a number of ways in which they can set their own pace and complete their goals in whichever amount of time they wish. For those considering this hybrid elliptical trainer, there are a number of negative aspects to this machine that everyone should keep in mind before purchase. For instance, the actual assembly of this 150 pound trainer is relatively difficult and can take quite some time to put together properly. Thankfully, the directions are quite detailed, but users should still expect assembly to take a few hours, at the very least. Unfortunately, anyone that has a question about this trainer will likely have difficulty contacting the companies customer service, which is unusually poor with this trainer in comparison to the customer service of many of its competitors. Also, while the 15″ stride is decently lengthy, there are a few other elliptical machines within the same price range that offer strides ranging from 18″ to 20″, as 15″ can be a bit too small for anyone over 6 ft. The ProForm Hybrid Trainer Elliptical is a product that anyone looking for a gym experience in their own home will be proud to own. 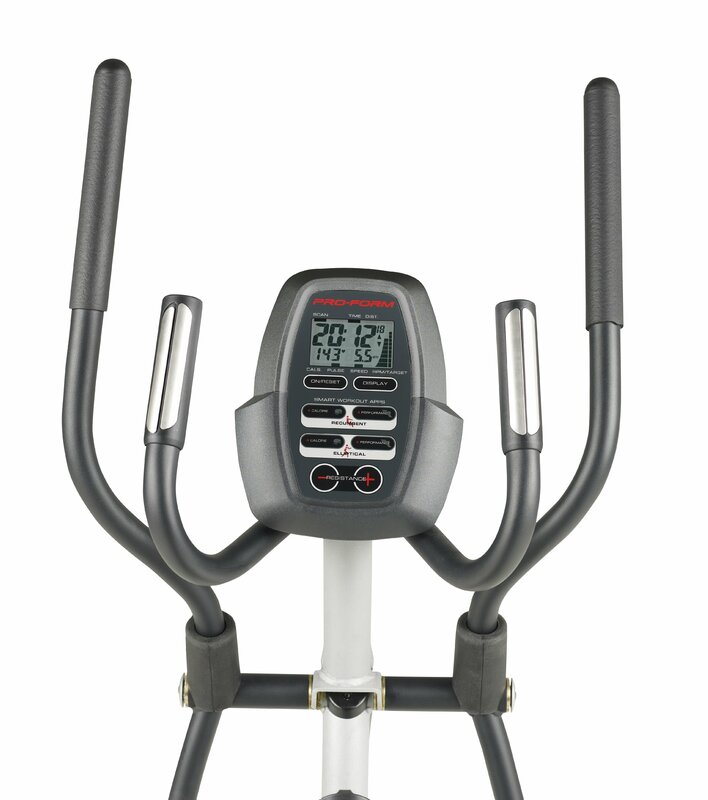 The flexibility of the machine, along with the myriad of innovative features, such as the crystal clear LCD display and the adjustable pedals, makes for a trainer that can prove useful during a wide range of different workout situations. The Body Rider BRM8800 Dual Trainer may be a bit more of an advanced hybrid trainer, due primarily to its extra training programs and adjustable seat, but at a price range of nearly $800, the features between the 2 are similar enough to where the ProForm is clearly the ideal product for its price range. While there are a few negatives associated with the machine, such as poor customer service and difficult assembly, the number of workout apps, resistance levels and customizable settings are positives that far outweigh the slight downsides.